On those first few words of Marius Delisle’s 1959 hit, I make my way to Quebec City and the surrounding area to find out how language professionals fare with English on a daily basis. 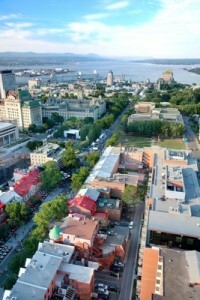 Of the more than 700,000 inhabitants of the Quebec City area, over 40 per cent of people between 25 and 44 are editors and translators.1 As in western Quebec and the Eastern Townships, most language professionals are women (over 80 per cent are editors, and about 70 per cent are translators). As one might imagine, people generally work and live in French in this part of the province. But is it unusual to do so in English? Not really. Not convinced? Just ask Jacky Tremblay, founding president of Traduction-Québec, one of the city’s language agencies. He says: “I believe there is a lot of work out there for English-language professionals. You just have to be resourceful and creative in how you grow your business.” Jean-François Melançon, a freelance French editor and translator at Albatross Translation, concurs with Tremblay, adding that it’s easy for English-language professionals to make a living as long as they’re open to taking a position outside their area of specialization. For instance, an anglophone professional can work as a sales representative for an insurance company. Instead of being promoted as a copywriter or editor, this professional might occupy a managerial position. This is not to say that language-professional jobs are nowhere to be found: according to Melançon, job searching in the language industry may simply require more effort. When asked about the difficulties professionals may have in finding English-language mandates, Melançon and Tremblay put forward two points of view. Melançon believes that newcomers to Quebec City and area may find it difficult to enter the market because, unlike Montreal, Quebec City (also known as Capitale-Nationale in administrative circles) is not a metropolitan urban area. Tremblay thinks that “the main difficulty is being noticed. You need to send a lot of emails or make a lot of cold calls at the beginning before your website gets enough visitors.” Professionals of all stripes can relate to that. I’ll end this tour of Quebec with a short visit to the Saguenay–Lac-Saint-Jean area, located north of Quebec City. Meet Ginette Tremblay. Yes, her name sounds and looks French, but believe it or not, she works in English. This is rather curious, given that the Saguenay–Lac-Saint-Jean is predominantly French. But despite the region’s “Frenchness,” it has one English school board, the Central Quebec School Board2 — and, of course, some English-speaking professionals. What are the main challenges of finding English editorial work in this area? “It is always challenging to find English editing contracts in a region where a good part of the population has no need for such services, since French is the main communication language,” says Ginette. She believes that a fair percentage of the population sees English as a nuisance either because it’s threatening to French or because learning it is unnecessary. However, a need for English is present, especially for professionals who seek work from businesses outside the immediate Saguenay–Lac-Saint-Jean area. Ginette continues to receive more English-language contracts as her clients come to realize the importance of language services. “My proofreading contracts come from people who understand the importance of well-written, error-free texts,” she says, adding that most of her clients are French-speaking researchers writing articles for magazines and specialized journals in their second — or in some cases, third — language. “Many of these articles are accepted, provided that they are proofread,” she concludes. Next topic: False cognates, syntax and interferences — Oh my! 1. Réviseurs/réviseures, rédacteurs-réviseurs/rédactrices-réviseures et chefs du service des nouvelles . emploiquebec.gouv.qc.ca. Emploi-Québec, 2003. Web. Feb. 3, 2015, and Traducteurs/traductrices, terminologues et interprètes. emploiquebec.gouv.qc.ca. Emploi-Québec, 2003. Web. Feb. 3, 2015.